We all want our children to live long, healthy lives, but how do we ensure that they do? Research shows that taking care of your body can significantly reduce the risk of becoming obese, or developing the chronic diseases that shorten people’s life span – heart disease, high blood pressure, diabetes, and cancer. Unfortunately, many children today don’t get the exercise or the good food they need to be healthy both now or in the future. The Orgamites want to change that! Look after your body, look after your organs, and we will all benefit – starting with you and your children! Heart: I love to get active! Running, jumping, dancing, playing – they really get me going, help me grow stronger and healthier! We all know that children should be active, but how much activity do they need to stay healthy? Children need more exercise than adults – their bodies are growing and changing, and need to move. And best of all, when they are active, they are strengthening their bones, their heart and their lungs! Children should be getting 60 minutes of activity each day, including at least three sessions of vigorous physical activity of 20 minutes or more every week. Physical Education (PE) at school is a good start, but children need more than just that. Whether it’s going to the playground, after school clubs, or walking the dog, children need lots of exercise. 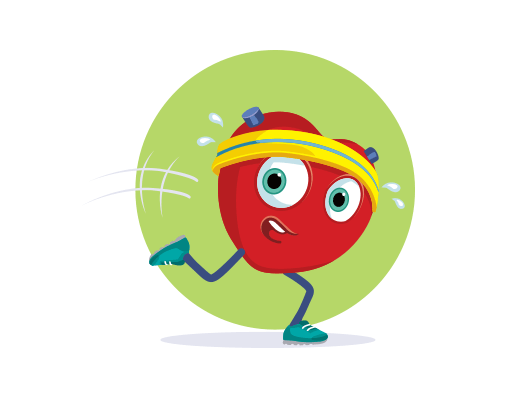 Heart: I love activities like dance, swimming, playing tennis or trampolining. They all help get me and your kids moving more and feeling better. What are the benefits of an active lifestyle? It will help develop their cardiovascular fitness, muscular strength, and flexibility. Children will gain more confidence in their physical ability, which will help to do everyday tasks. Exercise helps children achieve or maintain a healthy body weight. It helps to reduce overall body fat. Exercise reduces stress and improves your mood – in fact, MIND, the Mental Health charity, now recommends exercise as the most effective way to combat depression. Children will sleep better if they exercise regularly. Exercise will reduce their risk of diabetes, high blood pressure, heart attack, and cancer. Take a proper look at how much exercise your children get. Be honest too about your own exercise levels – are you setting a good example? If it’s not enough, resolve to do something about it. Speak to your kids about it. Explain why it’s so important to get enough exercise – all the info you need is right here. Talk together about what you can do as a family to exercise more – kids love doing things with their parents. Develop a plan that is fun, realistic, and will get you all moving more. Have your kids walk or take the bus instead of being driven everywhere. Play hide and seek as a family. Go to a park or to a local playground after school or on weekends. Play Frisbee or tag together. Go swimming as a family – most pools have a family play time several times a week. Set your kids fun, active challenges – how fast can they run, how high can they jump. Get them involved in household chores – hoovering will get them moving! Heart: What’s not to like about that? Let’s work together get your kids more active! 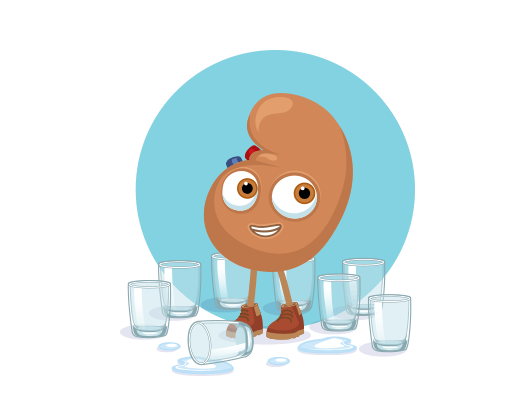 Kidney: I love water! Cool and fresh, it’s so soothing, it helps me feel in tip top shape! There are lots of choices when it comes to drinking – tea and coffee, juices, sodas and fizzy drinks – but one choice stands head and shoulders above the others if you want to be healthy – water. Why is water the best choice? Quite simply, it’s what your body needs. While you can survive for weeks without food, without water you wouldn’t last more than a couple of days. Throughout the day your child’s body loses water through urine and sweat. It’s vital that they replenish this lost fluid, but most drinks don’t really help with that process. Coffee and fizzy drinks are typically high in caffeine, which can dehydrate them further. In addition, fizzy drinks, fruit juices, and other sweetened drinks are packed with sugar, which is bad for your children’s health. And there are serious concerns about artificially sweetened drinks. All of this put a strain on the kidneys, and also makes the bowels and the liver have to work much harder. Dehydration can even put a strain on the heart. The answer is to drink pure water. The guideline is to try and drink eight glasses of water a day, which is about the right amount for most people. Many children don’t get enough water, and as a result are dehydrated. The symptoms of dehydration include thirst, dry skin, dark coloured urine, and tiredness. Make an honest assessment of what your kids drink every day. And how about you? Are you setting a good example? Start each day with a glass of water. Drink at least one glass of water with each meal. Don’t buy big bottles of fizzy drinks or fruit drinks. Limit your consumption of tea and coffee. Make water the go-to drink in your house. Some kids aren’t used to the taste of water. Adding a little lemon juice can help. Kids love ice in drinks. Iced water with fun shaped ice cubes can help them get more used to it. Give your kids an eco-friendly straw when they drink water. Kids love straws! Have them choose a special cup for drinking water, one that has a character or motif on it that they love. Make it available – have a water jug handy and in reach for your kids. If your kids are younger, always have a sippy cup with water where they can reach it. Buy a water filter – it will improve both the taste and the quality of your water. Kidney: So why give your kids fizzy drinks? Ditch the sodas, tea, coffee and juices, and be sure that they drink plenty of water every day. Eye: I love sleep! 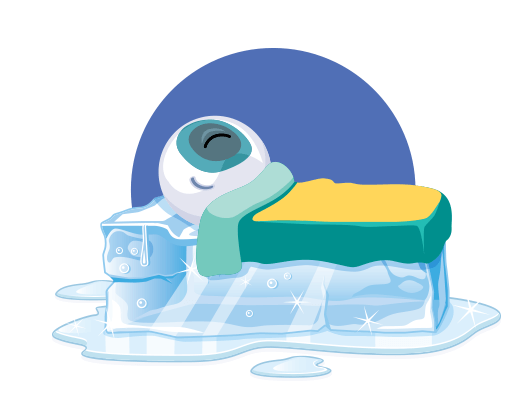 The chance for a bit of shut eye, eight hours of bliss, then waking up feeling bright eyed and…well you know the rest! We all sleep every night, but it’s clear that many people – including many children – don’t get enough sleep. For adults, it is recommended that you get seven to eight hours sleep per night, but children need more – around ten hours per night for primary school children, nine hours per night for teenagers. Eye: You know what makes me feel better than a good night’s sleep? Another good night’s sleep! Children who consistently get insufficient sleep will quickly suffer from sleep deprivation – in fact, as little as one disturbed or poor night’s sleep can begin to have effects on their health and performance. The long term effects are even worse, putting a strain on your heart, your liver, your bowel and your pancreas. Premature aging due to interference with growth hormone production. Eye: Drooping eyes, bloodshot eyes, eyes that can barely stay open? No thanks! Overall, people with chronic insomnia have a three times greater risk of dying from any cause. And children who don’t get enough sleep struggle in school. So how do you ensure that your children get a good night’s sleep every night? There are several things you can do to improve both the quantity and quality of your children’s sleep. Make your child’s bedroom as dark as possible. Even small amounts of light can disrupt their body’s internal clock and disturb their sleep, so keep your child’s room as dark as you can. If you have to get up in the night, try to avoid turning on any lights that will disturb other people or trigger your brain to wake up further. Stick to a regular bedtime. Your body develops rhythms, so consistently going to bed and waking up at the same time will help your children develop a pattern and thus fall asleep more easily. Avoid watching TV or looking at a computer or phone right before bed. Screens shine a light directly into your eyes, which stimulates the brain and disrupts your natural sleep/waking pattern, making it harder for them to get to sleep. Ditch the TV in your kid’s room, and consider not letting them have a laptop or phone in their room at night if they are using them right before bed. Avoid caffeine close to bed time. Caffeine is a stimulant, and can prevent kids falling asleep, so no fizzy drinks or coffee in the evening. Have a hot bath or shower just before bed. It’s a great way to make kids sleepy. If your child has sleep problems – difficulty falling asleep, or disturbed sleep through the night – you will find many more ideas online to help them sleep better. If the condition is chronic, you should speak to your doctor to ensure there aren’t any underlying health issues. If you have more than one kid, they might need individualized bed times that suit their body clocks better. Set a pattern and stick to it, even on weekends. If they have a radically different sleep pattern on the weekend, it will disrupt their sleep throughout the week. Turn off the TV two hours before bed. Staring at a screen stops the production of melatonin, the sleep hormone. Turn down the temperature. People sleep best at around 21 (70F) degrees. Make sure your kids aren’t scared at night – address any night time fears. Are your kids getting enough exercise? If they aren’t physically tired, it’s harder for kids to fall asleep. Make bedtime special – spend a few minutes with your children before they fall asleep, reading to them, singing to them, or if they are older, simply chatting with them. From toddlers to teenagers, most children spend hours each day staring at one type of screen or another, whether it be computers, phones or TVs. Research clearly shows that this is bad for kids, and many doctors are now suggesting that we should limit children’s screen time to no more than two hours each day. Your kids might complain about it, but there is no doubt that excessive screen time is a negative influence on health. First and foremost, screen time is sedentary – when your kids are watching TV or looking at a computer or phone, they are sitting down, not moving. Being active – simply moving around – is essential for good health. People who are physically active have lower risks of developing cardiovascular disease, diabetes, cancer, and osteoporosis. Lungs: Cancer! Yikes! Let’s get up and move around, get some fresh air! In addition, TV viewing is one of the major causes of excess weight in children, and has negative effects on both the activity levels and diet of young people. Those who watch the most TV have the worst diet, typically loaded with fizzy drinks and junk food. All of this overloads the digestive system, making it hard for the bowels, pancreas, kidneys and liver to do their job. It also affects the lungs, heart and bones when kids spend most of their time sitting and don’t move around enough. So how much time are young people spending staring at screens per day? According to recent estimates, children spend more time watching TV, playing video games, or on their phones, than they do in any other activity except sleeping – around eight hours per day. And it’s not just TV that has a negative impact – research shows that the more time young people spend engaged in social media, the more likely they are to suffer from anxiety and depression. Lungs: Eight hours a day? That’s a full time job! Measure how much screen time your kids have each day. If it’s more than two hours per day, look at what else they are doing – do they have any other interests, hobbies, activities? Any change to something like this needs to be discussed with your kids. Explain to them why it’s important to have a balance in what they do. Take a long, hard look at yourself. Do you set a good example, or are your kids just doing exactly what you do? Find other activities for them, so that they have alternatives. Are there books and (non screen) games in your house? If you need more things for your children to do, take them to the library, or buy them some games. This doesn’t take much money – the library is free, and charity shops are full of great kids’ games. Spend family time together on a regular basis that doesn’t involve a screen. When your kids do watch TV, make sure it’s a DVD or something without ads. Set limits – tell your kids why you are limiting screen time and when they have reached their daily limit. Use it as a reward – after they have done their homework, played outside, helped with some chores. Turn the TV off when you aren’t actually watching it. Having it on in the background the whole time encourages them to watch it constantly. Have TV or screen free days – it helps your kids to understand that life exists without a screen and that there are lots of other things to do. Don’t eat meals in front of the TV. Sit with your kids at a table to eat. 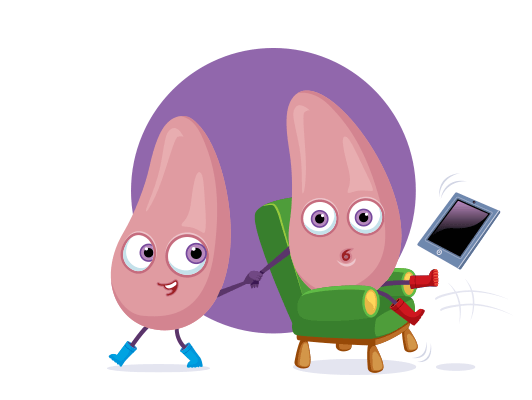 Lungs: By limiting the amount of screen time your children have, you will increase their activity levels, reduce the number of junk food adverts they see, and give them the opportunity to participate in a range of other activities, from playing with friends to reading a book. And that will make us much happier! Pancreas: My job is to take the energy out of the food you eat so you have the fuel you need to get through a busy day. The better the food you eat, the more fuel I can give you! The advice that we should at least five portions of fruit and vegetables a day has become ingrained in our culture, but despite the persistence of the message, very few children actually achieve it. They are good sources of potassium, fibre, and vitamins C, A, and B. They are low in fat. They reduce the risk of certain forms of cancer. They provide nutrients important for immunity, healing, and healthy skin and eyes. The five-a-day campaign recommends five or more servings (combined) of fruits and vegetables a day. Without enough fruit and vegetables, the organs don’t get the nutrients they need to operate at peak efficiency – this can affect the heart, the liver and the pancreas, as well as making digestion hard as fruit and vegetable are essential sources of dietary fibre. Pancreas: Five a day! That sounds yummy to me! Crisp crunchy apples, sweet strawberries, fresh greens, delicious veg! Bring it on! Explain to your children why they need to eat lots of fruit and veg. Make sure they have some fruit or vegetable with every meal – strawberries, banana and raisins go great with breakfast. Give your children fruit as snacks. Don’t be overly concerned about counting servings or portion sizes. Just make it a normal part of what they eat. Experiment with different fruits and vegetables, making it something fun to do to try different things. Once you have found which fruits and veg your children prefer, make those the core of what they eat, so it’s not an unpleasant experience for them. Set a good example yourself – you’ll feel better for it, and it will be much easier to get your kids to go along if you are practicing what you preach. Make food fun – they might like cauliflower a whole lot more if it’s served as cauliflower cheese, or bell peppers when they are served on pizza. The one bite rule – children need to be exposed to a food 8-10 times before they get used to it, so make them try one bite of new things. Mix it up. Give your kids different, interesting things to try. There are loads of different fruits and vegetables out there in a range of interesting colours. Make it a game to try different things. Get your kids involved in cooking – if they have helped cook it, they are more likely to eat it. Use seasoning – herbs, spices, butter, garlic, all of these can make vegetables more enjoyable. Don’t always serve the same vegetables. Offer one familiar, “acceptable” one (often this will be peas or carrots) and one other one. Gradually they will get used to a variety of veg. Cook them differently – roast veggies can taste a lot better than boiled. 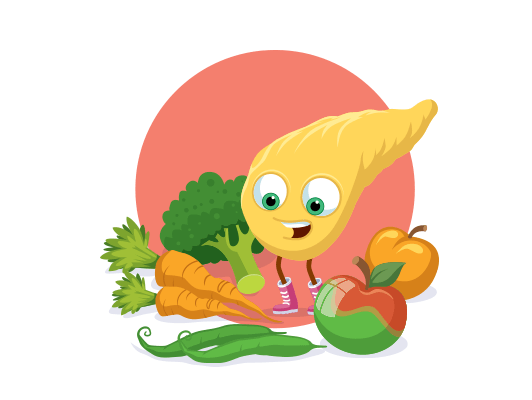 Pancreas: Adding some fruit and veg to your kids’ diet is one of the easiest ways to improve your health of your children and help me to keep them full of rocket fuel throughout the day! Sugar is everywhere. It’s in drinks and foods of all types – not just sweets and fizzy drinks, but also in everything from bread to pasta sauce. It’s therefore no surprise that children get 15-20% of their daily calories from sugar. This is a problem for two reasons. Firstly, sugar calories are “empty” calories – they contain no nutritious elements, no vitamins or minerals. Secondly, processed sugar changes the way your body deals with food, encouraging it to store calories and making you feel hungry sooner. So you eat more, and store more of what you eat as fat. 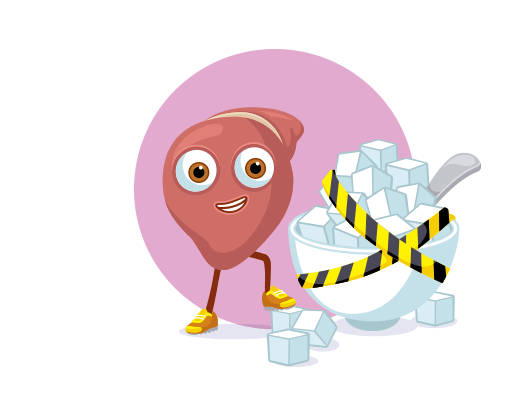 Too much sugar thus effects everything from the liver and kidneys to the pancreas and bowel. Sugar is the leading cause of the obesity epidemic seen in developed countries – in both the UK and the USA, around 1/3 of the population is obese, and a further 1/3 overweight. Little wonder when in the past 300 years, the average person’s consumption of sugar has risen from 4 pounds per year to almost 200. In the last hundred years, the incidence of diabetes has risen from 3 per 100,000 to 8,000 per 100,000, an increase of almost 3000%! Liver: I try to listen to Pancreas when she sends me insulin, but if I get too much sugar I just get overwhelmed and everything starts to fall apart. That makes me feel woozy, and you feel hungry even though you’ve just eaten. Sugar filled drinks – fizzy drinks, sport drinks, and fruit drinks – are the single largest source of added sugar in children’s diets, so eliminating them is the first, and usually biggest step you can take to reduce your child’s sugar intake. Second on the list of culprits are sweets, cakes, biscuits, ice cream, and other desserts. Finally, there are the hidden sugars that are added to all sorts of every day foods. From ketchup to baked beans, breakfast cereals to flavoured yoghurt, all sorts of every day foods are loaded with sugar. Ditch the fizzy drinks. Rather than being something your children drink every day, it is recommended that children drink no more than two 8-ounce (250-millilitre) sugar-sweetened drinks per week. Make water the go to drink for you and your children. It’s calorie free, and has numerous health benefits. Sweets of all kinds (cakes, chocolate, busy cuts, ice cream) have a place in the diet, but they should be viewed as treats, not an integral part of what your children eat every day. Learn to read labels – sugar goes by a dozen or more names (Sugar, sucrose, glucose, fructose, dextrose, syrup etc). Labels list in order of how much is in the product, so if the sugar is one of the first ingredients, don’t buy it. Provide your children with as much fresh, unprocessed food as possible. Start your kids’ day with a healthy meal. Many breakfast cereals – especially those marketed at children – are loaded with sugar. Read the labels and buy those that have less sugar. Replace fruit juice with fresh fruit – fruit juice delivers a big hit of sugar, but when it’s eaten as fruit, the fibre helps slow down the digestion of that sugar. We all know that fizzy drinks (sodas) are a problem, but be aware that juice drinks are often just as bad, and fruit juices are also packed with sugar. Eat fresh fruit instead. Beware of low fat products – they usually replace the fat with sugar. Offer your kids fresh fruit for snacks or as dessert – if they don’t want it, they probably aren’t really hungry. Don’t buy sugary food in the first place – if it’s not in the house, your kids can’t eat it. Ditch the sugary breakfast cereals. Replace sugar in recipes with fruit, nuts, coconut etc. Replace flavoured, sweetened yogurt with plain yogurt, then add fresh fruit to it. 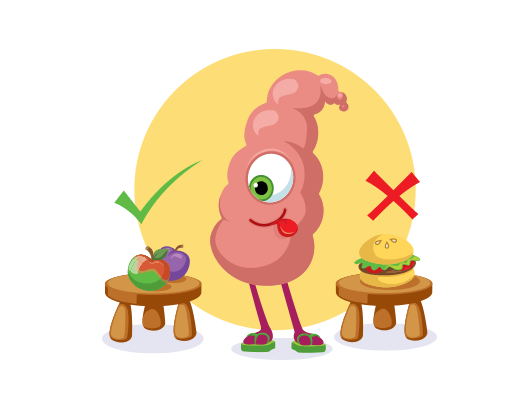 Liver: Fresh healthy food, lots of water to drink – I’m feeling better just thinking about it! Bowel: Junk food? Don’t get me started! Do you know what’s in that stuff, what it does to your insides? It’s not a pretty sight, believe me! Children love junk food. A lot of adults like it too! The problem is, it’s not good for their health. Indeed, according to researchers, consumption of highly processed foods can lead to classic signs of addiction, like loss of control and withdrawal. This is because the sugar, salt, and trans-fat formulas of these processed foods are designed by food scientists to ensure that our taste receptors find them irresistible. This manipulation of ingredients is backed up by a marketing blitz that begins before your children are even in school – according to a 2013 report by the Institute of Medicine (IOM), children aged two to 11 see an average of more than 10 television food adverts per day, 98% of which are for products that are high in processed fats, sugar, and/or sodium. Bowel: My job is to keep things moving, you know what I mean? But when you feed me junk food, well, it’s hard for me to do my job, so everything backs up…. When you yield to this temptation and feed your toddler junk food high in sugar, salt, and unhealthy fats, something disturbing happens – it has long term effects on their food preferences. They quickly start to prefer junk food over healthy food. The impact on children’s health can be far reaching. Junk food cogs up the system, making it hard for your bowel to do its job. This has a knock on effect to the liver and kidneys. And the lack of quality nutrients can affect the heart, even the bones. Not only does eating junk food deprive children of the essential nutrients they need to grow up healthy, it also affects their intellectual development. Researchers found that children who ate a predominantly processed food diet at age three had lower IQ scores at age 8.5 – for each measured increase in processed foods, children had a 1.67-point decrease in IQ. On the other hand, those eating healthier diets showed higher IQ levels. The answer, as with most things, is moderation. Junk food as an occasional treat or convenience are fine – but when they become a regular part of a child’s diet, it is an invitation to obesity and a range of other health problems. Learn to read labels. If there are more than two ingredients you can’t pronounce, chances are you don’t want to eat them either! Explain what you are doing to your kids. Help them to become partners with you in improving their diet and their health. If you have favourite meals that you are used to eating from a packet, figure out how to cook them from scratch. They will taste better and do wonders for your health. Limit your intake of junk food – fast food no more than once per week, and no more than one packaged meal per week. Expand your comfort range when cooking – learn some new recipes, and introduce them to your kids. Children need to experience a variety of different foods, not the same tastes over and over. Replace processed snacks with fruit. Avoid fizzy drinks, sports drinks and juice drinks – they are packed with sugar and chemicals. Always have healthy foods available for your kids – fruit, nuts, and healthy snacks. Keep your kids from watching too much commercial TV – it’s loaded with junk food ads that will make them want to eat more junk. Don’t ban foods – that creates conflict and confusion. Instead, limit them, and explain why to your children. Eat a freshly cooked dinner as a family in the evening, rather than a packaged meal in front of the TV. Get your kids cooking – if they helped make it, they are more likely to eat it. Bowel: How about we work together? You put the good stuff in, I’ll keep it moving all the way through. Believe me, we’ll both feel a whole lot better! © 2015 - 2016 DONROY ENTERTAINMENT. All Rights Reserved.